Two-person shows can make for tricky matchmaking - we’ve all seen pairings that seem fine on paper, but don’t quite jell in real space - so the juxtaposition of paintings by Ferdinanda Florence and Wynne Hayakawa comes as a pleasant surprise. Florence paints the anonymous suburban architecture of Vallejo (just northeast of Berkeley), “unyielding, quiet fixtures, stubbornly rooted in uncelebrated spaces,” with a strong interest in composition. 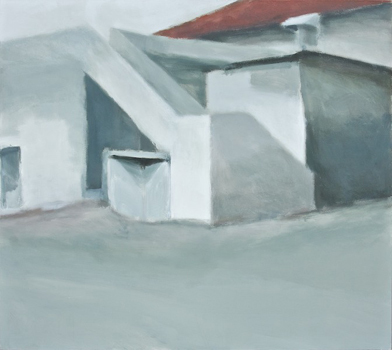 It’s easy to imagine her quiet, grayed-out forms as abstract, for all their painterly nuance; Georgia O’Keefe’s subdued paintings of adobes come to mind, as does Edward Hopper. Hayakawa paints trees - the oaks, bay, tan oaks and redwoods of coastal California - as more than trees, as “the archetypal forest of my imagination.” If Florence is austerely poetic, Hayakawa is opulent and rich, her bright palette, dappled foliage and gestural branches reminiscent of Georges Seurat and Gustave Klimt, through thoroughly contemporary in their oscillation between between abstract mark-making and illusionist representation. It’s tempting to see the painters as landscapists complementarily covering the natural and manmade worlds. Hayakawa’s trees (“Outlier,” “Orchard,” “Philo,” “Tiered Trees”) are done in organic oils, and Florence’s structures (“Yellow Cab” series, “Everett Road” series, “Lemon’s End” series) in synthetic latex and acrylic. But that ignores the psychological aspect. Both painters choose subjects amenable to emotional as well as pictorial investigation: Florence’s buildings “stand like figures in a landscape, at the intersection of inside and outside, private and public, familiar and unknown ... both exposed and guarded.” Hayakawa’s forests represent “delight in light and shadow, and the feeling of enclosure and intimacy.” These artists look at landscape and find themselves in it through painting. In the current aesthetic and economic climate, such commitment to the “motif” (in Cezanne’s sense) as an avenue to subjective truth is welcome. We badly need such grounding at the moment.